- The episode opened with a “Raw Before Christmas” video promoting Seth Rollins vs. Baron Corbin, Elias and Bobby Lashley’s Miracle on 34th Street Fight, Drew McIntyre vs. Finn Balor vs. Dolph Ziggler, and Ronda Rousey defending her Raw Women’s Championship against Natalya for tonight’s episode. Michael Cole wished everyone a Merry Christmas and a happy holidays. Elias was in the ring in a Santa hat and a guitar. He said the truths that follow everyone this time of year are peace on earth, goodwill to our fellow man, and that WWE stands for Walk With Elias. He said it’s better to give than receive, and he’ll give everyone the gift of defeating and humiliating Lashley in tonight’s Miracle on 34th Street Fight. Elias said he had a Christmas song that may be new tonight but will become a classic. He sang a song insulting Lashley and Lio Rush. There were Christmas trees and gifts surrounding the ring that got used during the match. At one point, Rush gave Lashley a box that was full of Legos. The fans chanted “Legos” as Lashley teased superplexing Elias on them, but Elias sent Lashley crashing into them. Cole and Corey Graves put this over as being devastating. Elias used a fire extinguisher and sprayed it into Lashley’s eyes. Rush got up on the apron, Elias shoved Lashley into him, and Rush went through a table on the outside. Elias opened a gift and revealed it to be a bowling ball, then rolled it into Lashley’s groin as Lashley was in the corner. Elias opened another gift, which was a cello. He smashed it over Lashley’s back and got the pin. As Rush was selling on the outside, Elias pushed cookies into Rush’s mouth and poured a bowl of eggnog on him. - Last week’s segment with the McMahons was recapped. It was hyped that Vince McMahon-ta Claus will be here tonight. Paul Heyman appearing was also promoted, and Bobby Roode & Chad Gable defend their Raw Tag Team titles against The Revival next. - A video of Heath Slater aired. He said he and his kids want Uncle Rhyno back on Raw for Christmas. The story of the finish was that Scott Dawson was pinned when Dash Wilder was the legal man. Roode made a save and tackled Wilder as The Revival were going for a double-team move. Gable reversed a suplex into a pin on Dawson to retain. Good match. The Revival used a lot of teamwork, Gable hit a big Chaos Theory German suplex at one point, and it appears that this is going to continue as the Raw Tag Team title program. - The B-Team were backstage singing Christmas carols. They tried to give Apollo Crews a B-Team shirt, but he said he’s already done his Christmas shopping. - Videos aired where the Lucha House Party wrote their Christmas list, Curt Hawkins said he wants to win a match, and No Way Jose said he’s going to bring the WWE universe and his conga line to the North Pole. - WWE hyped Lars Sullivan, Lacey Evans, Heavy Machinery, EC3, and Nikki Cross being called up from NXT. - In a selfie promo, Dolph Ziggler said he wants Shane McMahon to give him his best in the world trophy. He wants a DZ and friends special on Netflix and proof that he’s that damn good after defeating Finn Balor and Drew McIntyre. - Charly Caruso interviewed Drew McIntyre in the ring before the next match. He said he wasn’t worried about Balor and Ziggler teaming up to take him out. He said they’re going to do that and they should, but it’s not going to matter. They’re limited and he’s limitless. McIntyre said their pride and ego will get in the way. McIntyre said that after he disposes of Balor and Ziggler, he’ll go on to win the Royal Rumble and fulfill his destiny of main eventing WrestleMania. Balor and Ziggler did team up early, but Ziggler tried to roll up Balor the first chance he got. Balor went for the Coup de Grace later, McIntyre moved out of the way, and Ziggler gave Balor the Zig-Zag for a near fall. McIntyre slammed Ziggler on Balor, but Balor kicked out. Ziggler stopped Balor from hitting a Coup de Grace on McIntyre. As Ziggler was trying to pin McIntyre shortly after, Balor hit a Coup de Grace on both of them. Balor gave Ziggler a shotgun dropkick in the corner and hit the Coup de Grace for the win. McIntyre went for a post-match attack on Ziggler. He said he’s trying to save this place and Ziggler keeps screwing everything up. McIntyre called him pathetic and said there isn’t enough room here for both of them. McIntyre turned his attention to the referee, and Ziggler hit the Zig-Zag on McIntyre. - WWE aired a video on this year’s Tribute to the Troops and visit to Fort Hood. - The B-Team sang backstage again. Bo Dallas pushed over a Christmas tree when he couldn’t remember the words, and Curtis Axel said that wasn’t very Christmas-like. - Vince McMahon was dressed up as Santa in a video. He said “the greatest of all time” John Cena is back on Raw and SmackDown, that we’ll have Tag Team Champions in the women’s division coming next year, and that Ziggler will face McIntyre in a steel cage match next week. Near the finish, Fox broke up a pin after Banks hit a meteora on James. Moon then took Fox out with The Eclipse. Bayley made a tag, Banks gave James a backstabber, and Bayley hit the Bayley-to-Belly for the win. As Banks, Bayley, and Moon were in the ring after the match, The Riott Squad ambushed them from behind and attacked them. - Paul Heyman sang “Silent Night” in the ring, changing the words to make the song about Brock Lesnar defeating Braun Strowman. He said Lesnar is our Christmas Grinch. Heyman then began cutting his promo. He talked about Lesnar vs. Strowman at the Royal Rumble and mentioned that Strowman hoped Santa Claus would bring him a replica title as a kid, but now Strowman wants the real thing at the expense of Lesnar. Heyman said he was going to shoot from the hip to Strowman -- there’s no way Santa and Rudolph are bringing Strowman the title. All he’s going to get is a big lump of coal. Strowman interrupted Heyman. He came down with his elbow wrapped up and with an elbow pad, but he wasn’t wearing an arm sling. Strowman put a red nose and reindeer antlers on Heyman and called him the “red-nosed advocate.” Strowman said he has a message for Heyman to bring back to Lesnar. At the Royal Rumble, Strowman will be healed up and Lesnar is going to get these hands. - Natalya was interviewed by Caruso backstage. She said she helped train Rousey and no one knows Rousey better than her. Caruso mentioned that 2018 was a difficult year for Natalya, and Natalya said it was one of the most challenging years of her life -- but she’s determined, focused, and ready. Natalya said the Raw Women’s Championship would be a great gift for her and her family. - In a video, Alexa Bliss said she’s not asking Santa for anything -- because she’s perfect. 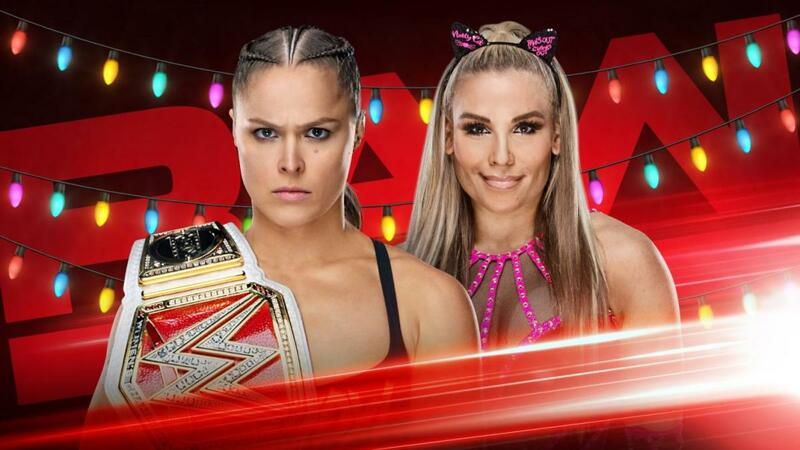 She wants Santa to bring Bayley a personality, Sasha Banks some humility, nothing for Natalya because she’s a lost cause, and some good makeup for Ronda Rousey. Tyler Breeze wished for a speedy recovery for Fandango and some Ariana Grande tickets. He was told he could only have one thing and said he’d take the tickets. They felt each other out early and ended up in a stalemate. The story of the early portion of the match was both going for submissions and countering each other. When Natalya went for a Sharpshooter, Rousey kicked her outside of the ring heading to commercial. Natalya was in control when we came back, with commentary pushing that Rousey may have cost herself by being concerned about Natalya when she kicked her outside. Commentary continued to push that Rousey may be holding back. Rousey came back with strikes in the corner, a throw, and a knee strike. Commentary said she hit the knee strike almost regretfully and still didn’t want to put Natalya away. Natalya got a two count off a roll-up and then another off a clothesline. Natalya went for the Sharpshooter, but Rousey kicked her off. Rousey hit Piper’s Pit and hesitated when going for an armbar. Natalya put Rousey in the Sharpshooter. Rousey tried to make the ropes, but Natalya pulled her back to the center of the ring. Natalya pulled her back when Rousey tried for the ropes again, but Rousey then reversed the Sharpshooter into an armbar to retain. Rousey checked on Natalya immediately after the match and was concerned about her. She spoke to Natalya, helped her up, and they hugged and raised each other’s arms. - Dean Ambrose cut a video promo. He said he wants to wish Seth Rollins good luck against Baron Corbin -- but not really. He said Rollins is a gullible fool who probably believes in Santa Claus. Ambrose said Rollins won’t get want he wants for Christmas this year, but Ambrose finally got what he deserves -- the Intercontinental title. Ambrose said Rollins will have a lousy Christmas if he loses to Corbin. Someone dressed as Santa Claus came out into the crowd during the match. Mahal was distracted, then the Singh Brothers attacked Slater for the disqualification. Mahal and the Singh Brothers attacked Slater until Santa came into into the ring. He fought off the Sighs, hit a Gore on Mahal, and it was revealed that Santa was Rhyno. Slater and Rhyno hugged. - The B-Team continued to walk backstage and sing. This time, they were exhausted and distressed. - Caruso interviewed Rollins about how he can stay focused on Corbin despite the threat of Ambrose hanging above him. Rollins said life is about moving forward and he’s focused on putting away Corbin once and for all. Rollins said Ambrose can’t take away his reputation and heart. - More Christmas wishes aired. Apollo Crews said he wants a big tank like Rusev's because being called the Raw human highlight reel is a lot to live up to. Crews said he's going to flip over the tank and moonsault over it. Konnor said the only thing The Ascension wishes for is to punish their opponents, but Viktor asked if that meant they weren't doing secret Santa this year. Kurt Angle said Christmas came early when he made sure Corbin didn't become the permanent GM of Raw. Rollins was dominant at the start before being struck by Corbin and sent to the outside when he went to the top rope. The show cut to commercial, and Corbin was in control after the break. The match got more back and forth from there. Rollins used a Falcon Arrow and Corbin hit the Deep Six. Corbin caught Rollins with a chokeslam backbreaker for a near fall, Rollins got a two count with a small package, and Rollins then avoided Corbin and sent him into the post. Rollins hit the curb stomp for the win. Rollins celebrated in the ring as Corbin headed to the back. Cole again wished everyone a Merry Christmas to close the show.